One of our long and low centerpieces. This is styled in an oval shape for a larger rectangular table, but the arrangement can be altered for a round table top. We will be more than happy to create this style in colors to complement your decor. 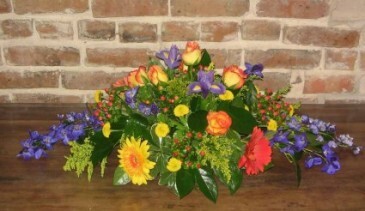 This stunning centerpiece was originally created for a Thanksgiving table, a very large table! The length of this beauty is a little over 3 feet, and it features bright, popping colors of autumn. Cherry Brandy roses, mango mini calla lilies, purple dendrobium orchids, blue hydrangea, mahogany hypericum, curly willow branches and thistle, all nestled in a long, low, leaf-wrapped glass rectangle. Springy and so romantic! 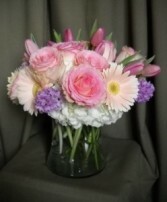 This wonderful vase full of blooms includes roses, gerbera daisies, tulips and hydrangea in soft pastel hues. 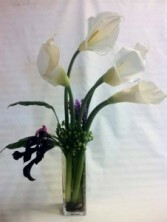 An elegant design of large, standard calla lilies, accented with a spray of miniature, eggplant calla lilies, a touch of purple liatris, and green hypericum berries, all combined in a heavy, tall, square, glass vase with polished river stones.